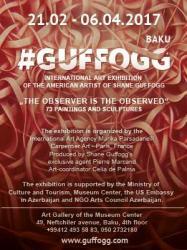 Baku Museum Center will host an exhibition by American artist Shane Guffogg on February 21, Trend Life reported. The expo will feature the artist's paintings dating before 2008. Moreover, guests will enjoy Shane's works dedicated to Leonardo da Vinci. His works artist calls "wordless poetry". On the whole, 73 paintings will be displayed in the museum until April 6. The event is co-organized by art agency Marika Parkdale, Carpentier Art Paris, with the support of Azerbaijan's Ministry of Culture and Tourism,the U.S Embassy in Baku and Azerbaijan and NGO Arts Council Azerbaijan. Guffogg`s works in oil on canvas and paper, and watercolor, gouache, and pastel on paper, in addition to traditional etchings on zinc plates. The size of the work ranges from the intimacy of 10” x 8″ to the monumental 10′ x 8′. His oils typically have 50-60 layers of translucent colors that have been mixed with a glazing medium, which causes the paintings to seem illuminated from within. Shane Guffogg was born in Los Angeles, California and raised on an exotic bird farm in the San Joaquin Valley. 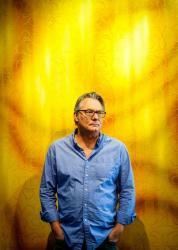 He relocated to Los Angeles, where he lived in Venice Beach and worked as a Studio Assistant for Ed Ruscha from 1989 until 1995. Artist's work began exploring the iconography of Ancient, Classical, Renaissance, Modern and Contemporary cultures, and the relationships among the various times and peoples. During this exploration he found that painting is one of the few art forms that may express what language cannot. The resulting work contains its own language of sign and symbol, and in its patterning, visual depth, and light, simultaneously seems to refer to emotion, to the human spirit, and to the unseen worlds of Quantum Physics and Super String Theory.